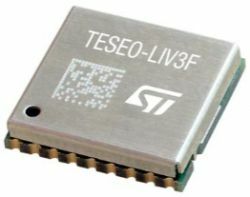 The Teseo-LIV3F modules bring the proven accuracy and robustness of Teseo chips to the reach of everyone: the embedded firmware and the complete evaluation environment save development time, while the compactness and cost-effectiveness of this solution make it ideal for several applications, such as insurance, goods tracking, drones, tolling, anti-theft systems, people and pet location, vehicle tracking, emergency calls, fleet management, vehicle sharing, diagnostics and public transportation. Within its 9.7x10.1 mm tiny size, Teseo-LIV3F is offering superior accuracy thanks to the on board 26 MHz Temperature Compensated Crystal Oscillator (TCXO) and a reduced Time To First Fix (TTFF) relying to its dedicated 32 KHz Real Time Clock (RTC) oscillator. Thanks to the embedded 16 Mbit flash Teseo-LIV3F offers many extra features such as data logging, 7 days autonomous assisted GNSS, FW reconfigurability as well as FW upgrades. Teseo-LIV3F provides also the Autonomous Assisted GNSS able to predict satellite data based on previous observation of satellite. Teseo-LIV3F module, being a certified solution, optimizes the time to market of the final applications with a temperature operating range from -40°C to 85°C.